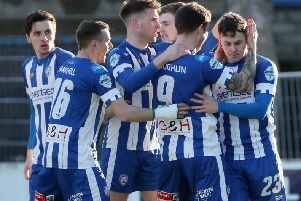 Coleraine eased past Dergview to set up an Irish Cup quarter final meeting with Larne. The home side made the perfect start as they broke the deadlock inside three minutes. Ben Doherty surged forward from midfield before unleashing a powerful drive past Ruairi McElroy from 20 yards. 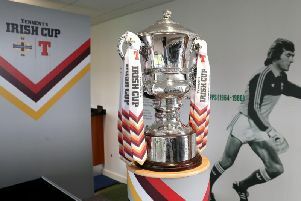 Adam Buchanan tried his luck from distance on 12 minutes after Andrew Sproule had been brought down by Gareth McConaghie, but his long-range effort fizzed past the upright. The Bannsiders doubled their advantage on 22 minutes after a good combination from Jamie Glackin and Mark Edgar down the left. The wide man played in the full back, whose low cross was drilled in off the bar by Jame McLaughlin. Five minutes later McConaghie fired a free kick wide of the mark. Coleraine dominated after the break. McGonigle had a shot blocked by McElroy after Lowry had sent him clear, before Glackin tested the keeper with two close range efforts. In a rare excursion in the Coleraine box Sproule flicked an effort on to the cross bar. With 20 minutes to go the home side added a third through debut man Dean Shiels, who slotted home at the back post seven minutes after coming on. They almost grabbed a fourth with 11 minutes to go as McGonigle's shot took a horrendous bobble in front of McElroy, but the keeper reacted brilliantly to somehow scoop it over the bar.